The namers of the cultivar got it right: The chief selling point of Firebird coneflower is its fiery flower color. Its bright orange color makes it one of the best perennials to grow in full sun. But it has a few other noteworthy qualities, as well, including its drought tolerance, ability to draw wildlife, winter interest, and suitability as a cut flower. Botanical Name: Echinacea Firebird. Firebird is a cultivar name. Firebird coneflower is touted as having red flowers. Under certain growing conditions, this is doubtlessly true. But the flowers often turn out reddish-orange. Likewise, the flower is described by its promoters (and by other sources) as having a "shuttlecock" shape (like the birdie used in badminton), but newly-planted specimens may fail to assume this form until the plant has matured. The leaves of this perennial are dark green. It has a clumping habit. When the flowers first form, they, too are green. The plant is valued as a long-blooming perennial. Another orange coneflower cultivar is Secret Lust, although, in other respects, this cultivar is quite different from Firebird. While they prefer to grow in a well-drained soil, Firebird coneflower plants are otherwise tolerant of a number of soil types, including ground that is poor in nutrients. These reddish-orange coneflowers are drought-tolerant perennials once established. Combine them with other sun-loving perennials. Divide the plants in spring whenever your patch of Firebird coneflower seems to be losing vitality, due to overcrowding. Some gardeners deadhead theirs. But this is done not so much to promote reblooming (they will rebloom on their own) as for aesthetic reasons. 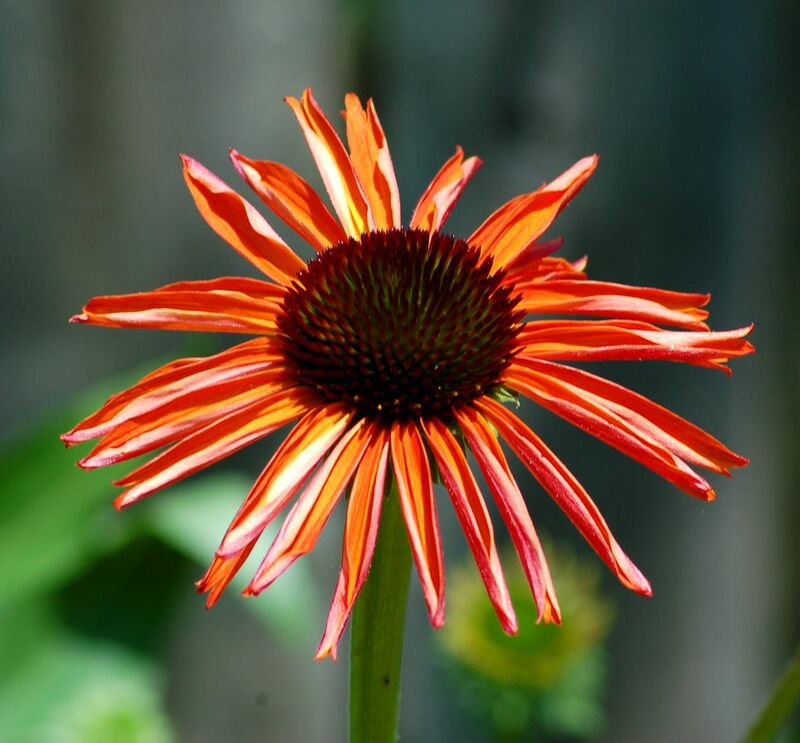 Given its Echinacea parentage, this orange coneflower cultivar can be treated as if it were a type of wildflower and used in a meadow planting. But the average grower is perhaps more likely to use it in rock gardens, considering its drought resistance. For the same reason, it is useful for xeriscaping. Its medium size would recommend it for the middle row in many flower beds, assuming the front row consists of short perennials and groundcovers. The Echinacea genus boasts uses beyond the landscaping arena. You may be familiar with the extract, for example, which reputedly helps the human immune system. Such medicinal uses cause some to classify these plants as "herbs." Echinacea, generally speaking, makes for a good cut flower, and this reddish-orange coneflower is no exception. So cut a few stems and bring them indoors to enjoy the vibrant color of the flowers. Likewise, winter interest is a trait associated with coneflowers in general, owing to the dried cones left behind on the flowers at the end of the growing season. One July or August day, you may open your back door and step out to find a goldfinch perched on the cone of one of your Firebird coneflowers. The perennial is considered a veritable bird magnet, reputedly attracting hummingbirds, among other types. It is also a plant that attracts butterflies. With all of this wildlife drawn to the plant, you folks in Bambi country may worry that deer eat this plant. Luckily, however, Firebird coneflower is a deer-resistant perennial. We are not so lucky, however, when it comes to another major pest: The perennial is not one of the rabbit-proof flowers. Then there is the insect world's fascination with Echinacea. For example, slugs, snails, and cutworms are all known to eat the leaves of perennials in this genus. To grow these flowers successfully, be prepared to remain vigilant, inspecting your plants on a daily basis, and keep some organic neem oil or other pesticide handy at all times. Otherwise, you will have to put up with having the foliage look like Swiss cheese (assuming the rabbits do not get to it first). The genus name of Echinacea derives from echinos, which is Greek for "hedgehog." The flowers' cones, which consist of a network of tiny needles, inspired the name. Likewise, the origin of the common plant name of "coneflower" lies in the so-called "cone" found at the center of each bloom.